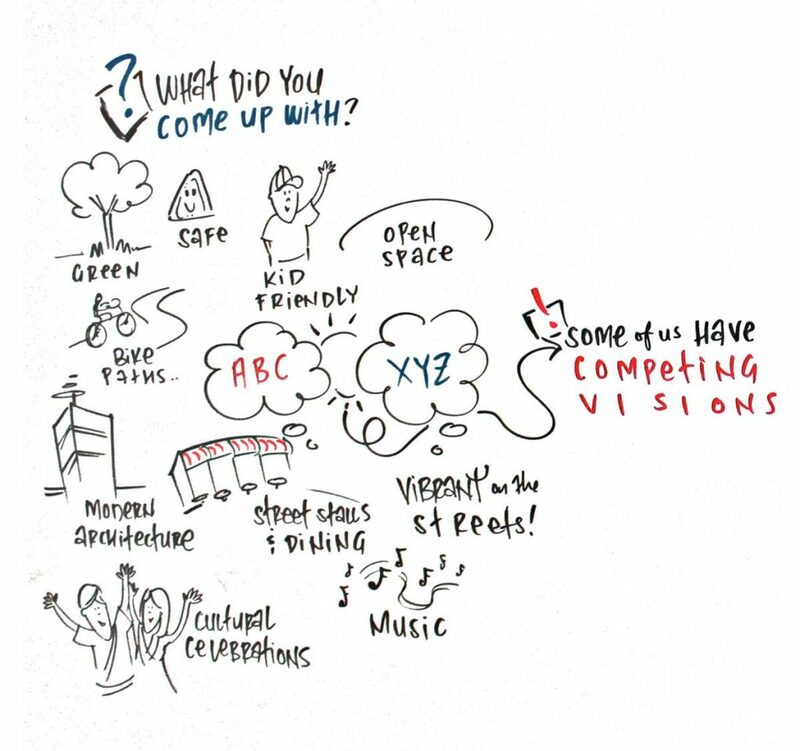 With UrbanGrowth NSW now a major player in urban renewal, Inner Sydney Voice asked the organisation to explain what communities should expect from it when it engages with local communities. Community Engagement Manager Abbie Jeffs explains how UrbanGrowth NSW sees engagement as essential to successful transformation. We’re transforming the way we do engagement to ensure we can successfully transform our city. As one community participant in The Bays Precinct planning put it, “it’s not just one person having one idea, and another person having one idea, but when these ideas come together, a third or fourth or even better idea can come out of it. This is a very important part of the whole process”. UrbanGrowth NSW is committed to best practice engagement, continued learning and improvement, to enable people to take an active role in decisions affecting change in their community and shaping the city they live in. Areas undergoing transformation will experience significant change in mix of uses and densities over the medium to long term. People have a right to have a say about decisions that affect their lives. We acknowledge that we won’t always get it right and we won’t always live up to the expectations of our stakeholders. Sometimes there will be pressures – budget, timing and resourcing, for example – that result in less than ideal outcomes. Sometimes there will be circumstances outside of our control which mean we won’t be able to engage as we intend. However, we recognise the importance of engagement and our aim is to do it well and to continuously improve. We know that by involving communities we can make better decisions about how to manage growth and change across the city. Engagement enables assumptions to be tested against local knowledge of how areas operate. We are progressively documenting our engagement framework – our approach – in parallel with delivering engagement activities on projects. This enables us to incorporate lessons we learn along the way into the framework. Our practice draws on a number of widely accepted foundations that underpin best practice as advocated by organisations like the International Association for Public Participation and the National Centre for Dialogue and Deliberation. These foundations are discussed below, with reference to specific projects that demonstrate our approach to getting community engagement right. We aim to have a collaborative approach to project delivery. Collaboration with all stakeholders, including state and local government authorities, industry, local communities and the general public, helps us to identify innovative solutions that are broadly supported by all stakeholders and that maximise public benefits. For example, on the Parramatta Road project we have agreements with nine councils to enable open communication and promote a team approach, and whole-of-government solutions to be identified and delivered. We aim for engagement activities to be purposeful, which means we try to carefully plan them to support project delivery. We identify interested stakeholders and define how to appropriately engage them given the scope of each project. This helps to ensure our engagement activities serve a clearly defined purpose and are appropriately resourced. Purposeful engagement also means being clear with stakeholders upfront about how engagement links with decision-making and what opportunities there are to influence outcomes. This can involve difficult conversations, but we know honest engagement is about being clear from the start about project drivers and opportunities for stakeholder influence. One of the biggest challenges we face is negative community attitudes to ‘development’ coupled with very low trust in the planning system. As we are aiming to deliver homes and jobs, our engagement is not going to be about growth or no growth. Our focus will always be about how to plan and manage growth in a way that ensures areas remain highly desirable places to live, work and visit. 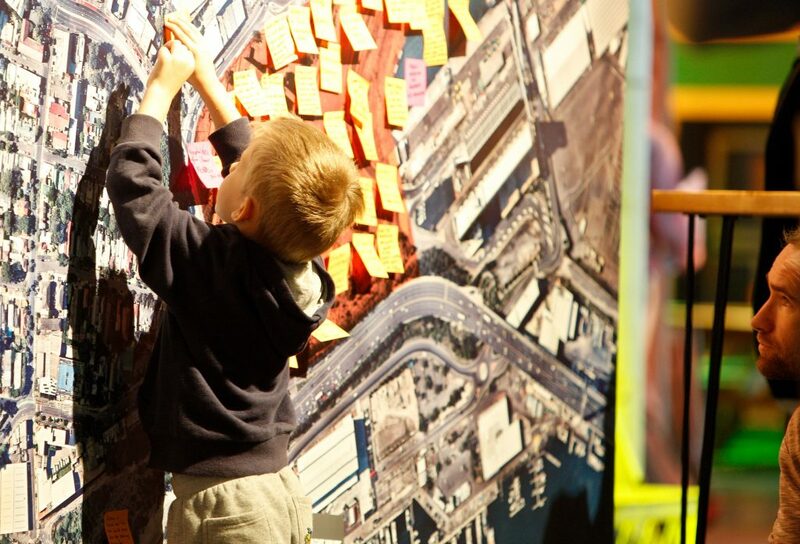 On the Central to Eveleigh project we recently held a large community workshop which provided opportunity to openly explore trade-offs associated with significant new development. We openly discussed building heights and reiterated that the purpose of community feedback was to shape plans for how to deliver higher density development to balance and maximise benefits for local neighbourhoods, the city and the greater Sydney area. One participant stated that “the honesty of discussion” was the best thing about the workshop. 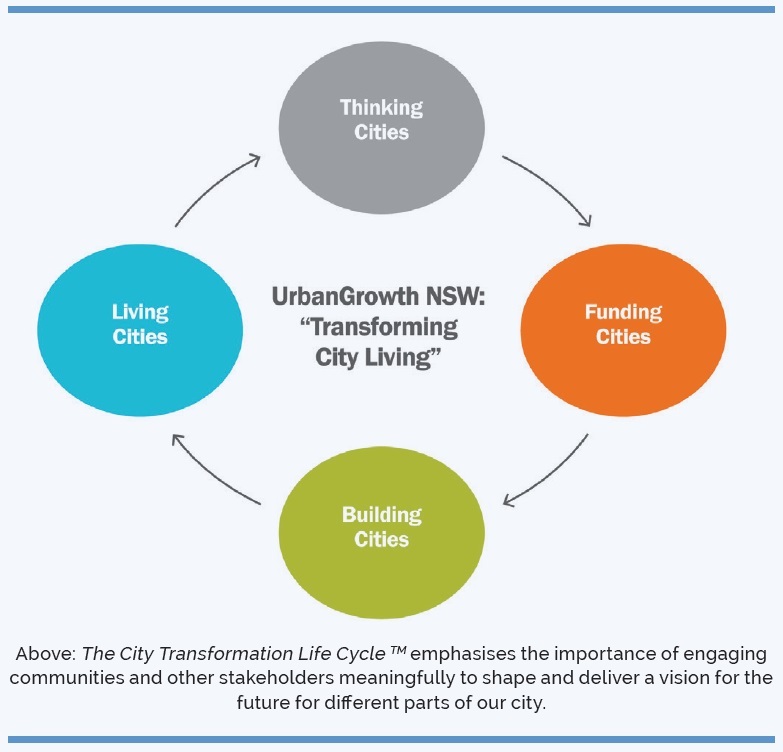 We aim to be proactive which means engaging stakeholders early and often throughout project planning and delivery, including deep engagement at the ‘Thinking Cities’ stage of the Life Cycle (see What is UrbanGrowth NSW below). Being proactive also means making information readily available and providing sufficient time for stakeholders to make sense of information so people can engage meaningfully and provide informed feedback. To make it easy for people to participate we try to provide information that is accessible and easy to understand. For example, the Central to Eveleigh project recently hosted a series of study nights where consultants answered questions and provided a simple plain-English summary of their work. We recognise the need to work even harder to communicate using simple language and concrete examples, which one workshop participant said will help people “develop a clearer and shared understanding”. Being proactive also means taking activities to where people are and providing visible opportunities for communities to learn about initiatives underway to transform the city. For example, we currently have monthly stalls at local markets and at community events for the Central to Eveleigh project, and on Parramatta Road we will be door-knocking businesses to ensure they are aware of opportunities to shape the plans affecting change in the corridor. Being accountable means communicating to stakeholders how their feedback has been used in shaping decisions. One member of the community told us the feedback report from the initial consultation on the Parramatta Road strategy was “easy to read with the right tone and language, covers the issues in sufficient detail and seems to be balanced in presenting all of the views that were expressed”. Reporting back helps to build trust. It helps stakeholders understand how their interests have been considered alongside those of others, and how decisions have been made to balance the needs of different stakeholders. This is an important foundation of good practice because often communities feel upset if decisions do not fully reflect their interests. However, the reality is we have the complex task of addressing competing and conflicting stakeholder priorities, which necessitates balanced decision-making. We hope that our stakeholders may accept that decisions are legitimate if the process has been robust enough to ensure their views have been meaningfully considered. One active member of an inner city resident group recently wrote to us saying, “I can’t imagine how hard it must be to have to keep working at such different levels on different aspects with developers, government departments and then the various and diverse community and interest groups….based on past experiences and comparisons, we can see how genuine and sincere you are in consulting with the community and listening to our requests and issues for what could be classified as ‘minor details’ of place making”. We aim to be inclusive, which means we make an effort to engage a range of stakeholders and reach out to people who don’t often get involved in local issues. We seek to encourage participation and build awareness of everyone who may be affected by or interested in transformation outcomes. This helps to ensure a diverse and representative range of stakeholders are engaged, including people of different ages, gender, culture and interest in projects. For example, young people who have a lot to gain from urban transformation are often under-represented. For The Bays Precinct we hosted a Schools Leadership Forum for students to share their ideas for the future of the area. A 17 year-old participant said, “it’s important to talk to people my age because we will be the people who will be employed in the area and live here”. We know that a ‘one size fits all’ approach to community engagement never works and results in only a narrow cross section of community needs and interests being considered. For this reason, on many projects, including the Central to Eveleigh project, we have assembled a community panel made up of randomly selected residents who are broadly representative of the wider community who can work with us over an extended period of time to provide in-depth feedback about transformation plans. This helps ensure we get informed feedback from a cross-section of the community. UrbanGrowth NSW is committed to high quality engagement across our projects. We welcome feedback on our engagement processes. We’ll meet with community stakeholders to discuss their views about best practice engagement and get their feedback on our approach. For more information about the organisation, projects and upcoming opportunities to participate, visit www.urbangrowth.nsw.gov.au. We hope you will get involved and help shape the city we all live in and love. Abbie Jeffs is a Community Engagement Manager at UrbanGrowth NSW, working on a number of projects including Central to Eveleigh and Green Square. The NSW Government has established UrbanGrowth NSW to undertake and coordinate the urban renewal and development of strategic and complex Government land sites in some of the areas that are most critical to Sydney’s future, and we recognise that we must take a collaborative approach with communities and other stakeholders. 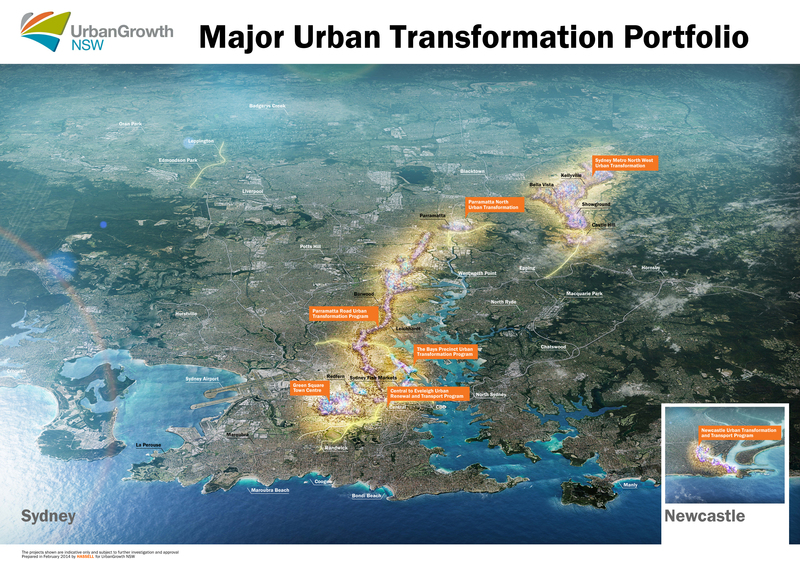 UrbanGrowth NSW is the NSW Government’s urban transformation agency. Our ambition is to transform city living by delivering projects that create more vibrant, connected, resilient and globally competitive urban areas for the benefit of all who live and work in them. Create great places, great spaces and great opportunities for happy and prosperous communities (Living Cities). We also deliver our projects to meet broader goals for our city and State as set out in NSW 2021, the NSW Government’s 10 year plan to deliver on community priorities and A Plan for Growing Sydney, the Government’s metropolitan strategy for managing the city’s growth. We focus on places identified by Government as needing renewal in established urban areas – those that are close to jobs and services and which can take advantage of existing infrastructure, without contributing to unsustainable suburban sprawl and growing ever-outwards. Our projects are large in scale, complex in nature and long-term in delivery, and provide a wonderful opportunity to take city living into the 21st century. Getting this right requires strong leadership, a collaborative approach, an international perspective and a steady commitment to a bold new future for NSW and its people. Green Square – A 14 hectare area next to Green Square Station. With the exception of Green Square, all these projects are in the early stages of planning, in the ‘Thinking Cities’ phase, where our current focus is on working with stakeholders, including communities, to identify aspirations for the future and to shape a vision for each area. Green Square, after nearly 20 years of planning, is in the ‘Building Cities’ phase with construction of the first apartment buildings in the new town centre currently underway. Urban transformation, renewal and regeneration are all terms for major development that aims to revitalise specific areas. We prefer the term ‘transformation’ as it best describes the entire process we undertake: a long term process of dynamically changing, re-shaping, evolving and enlivening our cities to become even greater urban environments for future generations to live, work, visit, learn and invest in. Sydney is one of the world’s great cities, with a strong economy, spectacular natural environment, skilled workforce and relaxed lifestyle. A sign of its prosperity is that our city is growing. 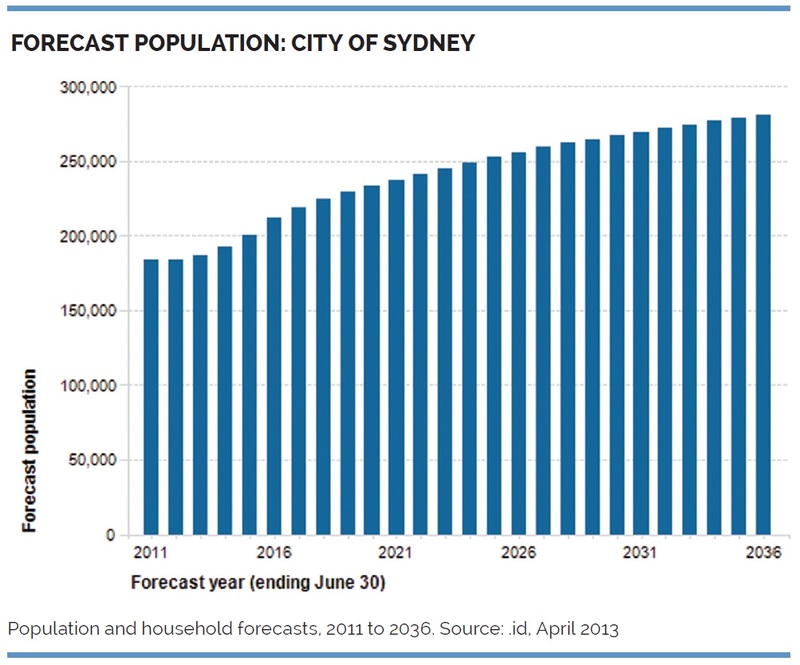 This growth brings a responsibility to plan well now so that we can ensure Sydney remains globally competitive, meets the needs of its future communities, and also retains those qualities that we value about the city and our lives here.